Shipments of protected African species, including tortoises, pythons and parrots, to Asia have soared since 2006 as demand grows in the Far East for exotic pets, meat and other animal products, a new study has warned. Wildlife imports of leopard tortoises, African spurred tortoises and ball pythons into Asia have increased nearly tenfold in a decade, the report by monitoring network Traffic said, while trade in animal skins including seals also rose. Much of the trade is legal, and all of the species in the study are protected under the Convention on International Trade in Endangered Species. 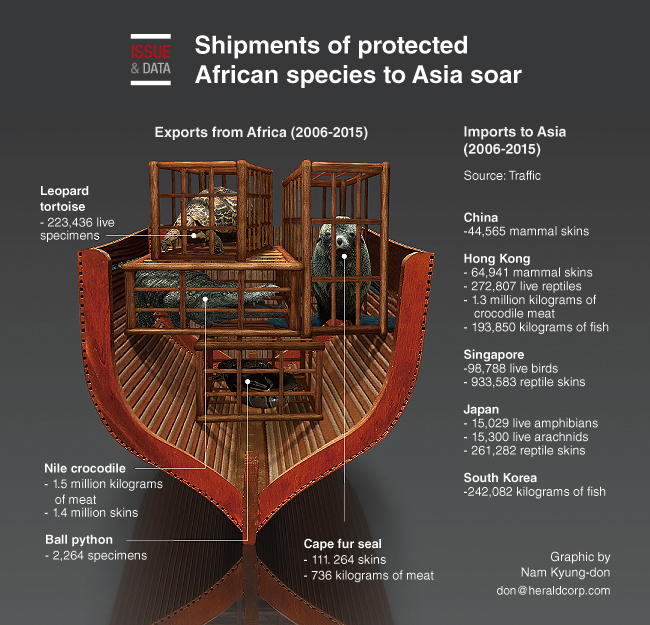 Using import and export databases, the report found more than 1.3 million live animals and plants, 1.5 million skins and 2,000 metric tons of meat from CITES-listed species have been exported from Africa to East and Southeast Asia since 2006.